This April 2018, Tony's Chocolonely has been announced as the winner of Sustainable Brand Index in The Netherlands. Tony’s Chocolonely is a Dutch chocolate brand that has been newly added to the study this year. With a strong focus on slave-free chocolate and fair trade principles, the Dutch consumer gave Tony's Chocolonely the highest score in environmental and social sustainability compared to all other brands. The chocolate brand is leading the overall ranking and the Food & Beverage industry it is part of. Tony's Chocolonely's started in 2003 with the Dutch journalist, Teun van de Keuken, discovering that child slavery is alarmingly common in West Africa, - where 60% of the world's cocoa comes from. When discovering the shocking facts around slavery in the cacao industry, Teun rang every single chocolate maker in the world. Nobody would talk to him or could reassure him that their chocolate was slavery-free. 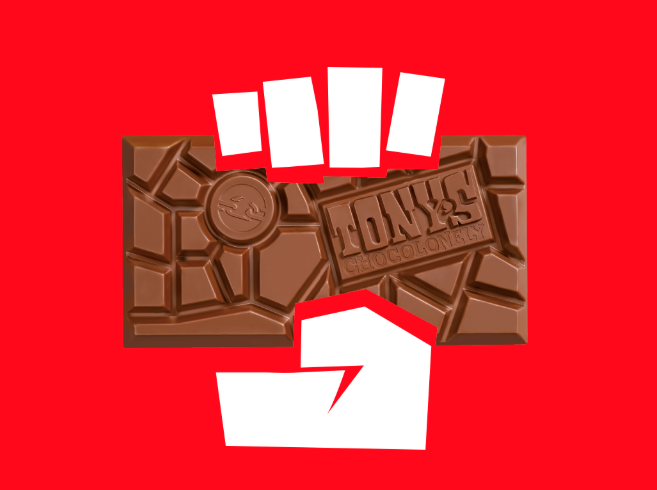 Now in 2018, Tony's Chocolonely has sold over 28 million chocolate bars worldwide and is setting an example for the entire industry on how to work towards 100% slave-free chocolate. The main reason Tony’s Chocolonely exists is to change the fact that child labor and modern slavery is happening on cocoa farms in West Africa. The brand is working towards a more evenly distributed supply chain and slave-free product. You can discover all the facts behind Tony's Chocolonely's impact here. Congratulations! How important has winning Sustainable Brand Index in the Netherlands been for Tony's Chocolonely? We want to lead by example and this award is a recognition for the effort. More importantly, it helps to inspire others to joins us and change the chocolate industry. It’s also a recognition for the more social side of sustainability. As Tony's Chocolonely Chief Evangelist, how do you work with sustainability within the company? We don’t have a specific CSR Manager within Tony’s Chocolonely. For us sustainability is in all aspects of our brand. In other words, it is engrained in the DNA of our company. Everyone in our team carries the responsibility to do things differently, and hopefully better. Which demands around sustainability do you see in the market today and onwards? Sustainability has become a critical business success factor. The challenges require continuous improvement and high ambitions. Let’s raise the bar! Which sustainability issues will be the main focus for Tony's Chocolonely in the near future? Our mission will remain our main focus: 100% slave free as the norm in the chocolate industry. Lastly, what do you plan on doing in order to keep your leading position in Sustainable Brand Index next year? Raise the bar! We always work hard to improve what we do. Furthermore, we are planning to expand even more internationally and grow the movement for 100% slave-free chocolate.